The OMEGA Museum Collection arose from a desire to combine the traditional values of the OMEGA brand with the very latest technological standards. Only a few watchmaking brands can look back on so many highlights that have written watchmaking history. Numerous souvenirs of this rich past are on display at the OMEGA Museum. The OMEGA Museum Collection brings back to life as limited editions some of the unique watches from the museum – watches that have marked the company’s history and are sure to win the hearts of watch enthusiasts and collectors all over the world.In addition to illustrating part of the brand’s history and showing the considerable potential of the OMEGA Museum, the Museum Collection meets a clear demand among collectors for historical timepieces from the company. The first model in the collection, launched in 2001, was a replica of a 1938 pilots’ watch with a bi-directional turning bezel for calculating flight times. As a tribute to the habits of the early pilots who wore the original, it was supplied with an extra-wide and extra-long leather strap (approx. 6 x 60cm) for wearing above the knee. 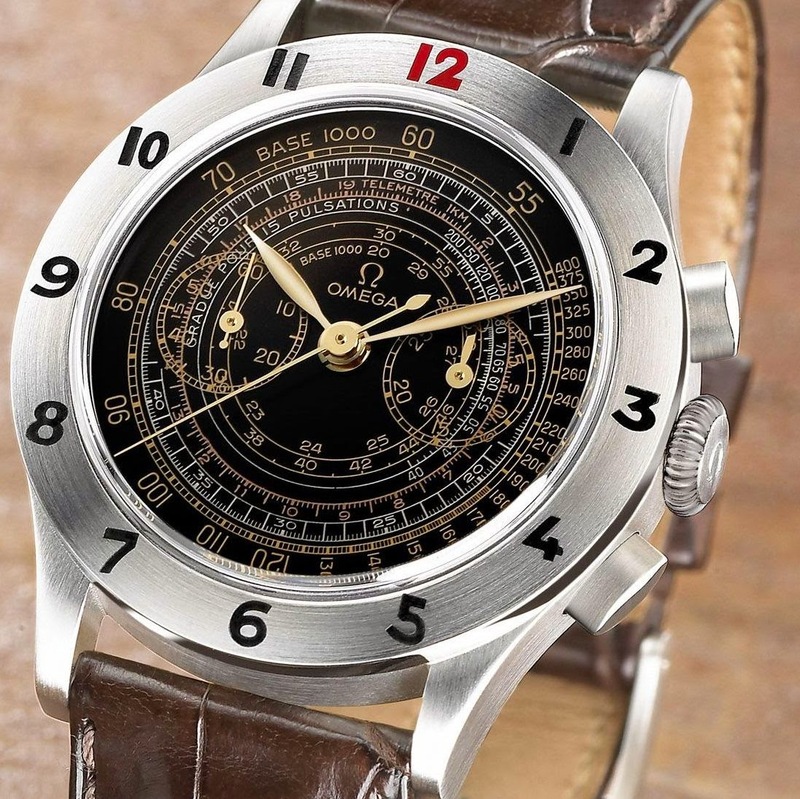 Collectors’ piece number two was a reproduction of the 1951 “Cosmic” watch, the first-ever OMEGA watch with a multiple calendar complication. Produced in 18-carat red gold, this model displays the exact time, date, day of the week, month and moon phase. Collectors’ piece number three is a reproduction of 1945 officers’ watch. Originally produced for a bygone military period before computers and satellites, this instrument watch has a highly technical dial containing tachometer, pulsometer and telemeter scales was particularly useful for military officers on active service in the field for determining speeds and distances. The third watch in the collection is a rare type of chronograph from 1945 – rare because it is unusual to find a watch with a tachymetric scale from 400km/h to 20km/h on the dial together with telemetric and pulsometric scales. 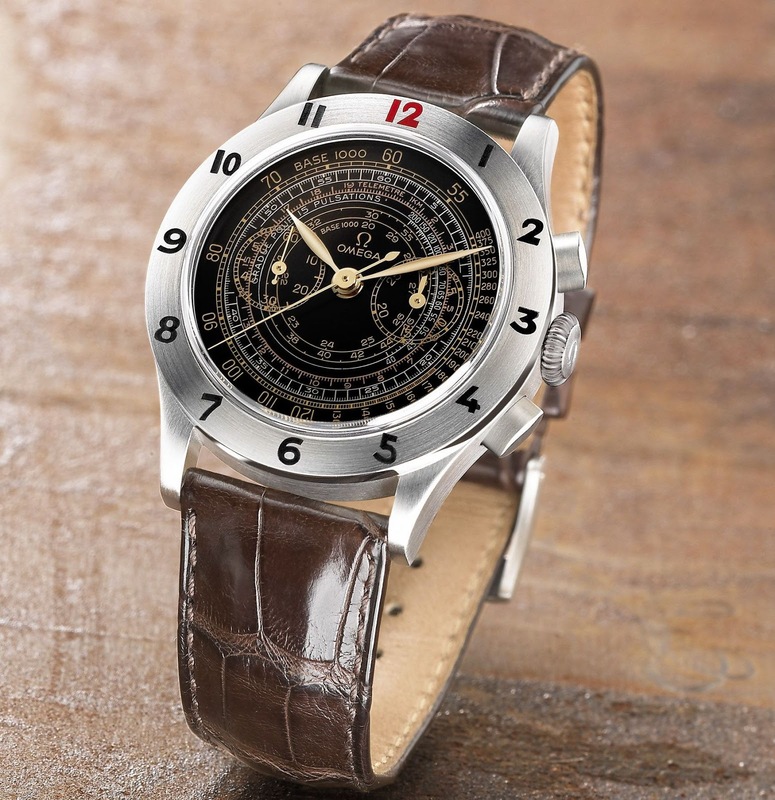 In keeping with the Museum Collection philosophy, this re-edition retains the same essential characteristics of the original, save for a few minor improvements to bring it up to the latest technological standards: a domed, scratch-resistant sapphire crystal with anti-reflective treatment, clearer markings on the dial, better quality leather for the strap and water resistance to 30 metres. The watch case retains the original 1945 diameter of 38.4mm, as well as its distinct look of the period: entirely satin-finished, with only the very smallest of polished areas on the bevels of the bezel and chronograph pushers. The crown also has the typically intricate grooved design of the period. The case back has a special museum limited edition inscription, as well as the limited-edition number, engraved on it. The watch is driven by the OMEGA calibre 3200, a manual winding chronograph movement manufactured exclusively for OMEGA by Frederic Piguet SA. This movement has a prestige column wheel mechanism to ensure precision operation of the chronograph functions and a power reserve of 55 hours when fully wound. Tachymeter: The tachymeter is a standard feature of most high-end chronographs. However, whilst most tachymeters have a single scale reading down to 60, the OMEGA Museum Collection 2003 has three separate tachymeter scales (in yellow gold) that are graduated down to 20. The tachymeter can be used to calculate the speed of a vehicle by measuring the time taken to travel a reference distance of 1000 metres. Equally, the scale can be used to calculate the hourly output of a machine, for example: if the time taken to produce one item is measured, the tachymeter scale gives an immediate indication of how many such items the machine produces in one hour. Telemeter: The telemetric scale (in red gold) allows calculation of the distance from the observer of an event that is both visible and audible. The best practical example of its use is in a thunderstorm: the chronograph button is pushed when a flash of lightning is seen and then stopped when the thunderclap is heard, the central chronograph hand pointing to the telemeter scale then indicates how far away the storm is from the observer in kilometres. Pulsometer: This scale (in silver) is used to take a person’s pulse based on 15 beats. The chronograph is started on the first beat and stopped on the 15th, the pulsometer scale then indicates the heart rate in beats per minute. The classic look of this historical OMEGA timepiece is completed by a brown alligator leather strap with satin finished buckle. Presented in a special Museum Collection gift box, it is sure to find favour among watch collectors and admirers of unusual timepieces alike.The classic look of this historical OMEGA timepiece is completed by a brown alligator leather strap with satin finished buckle.